Led Zeppelin Sued Over 'Stairway To Heaven' Guitar Line : The Two-Way Did a band from Los Angeles get ripped off by Led Zeppelin? That's the claim made in a new lawsuit by representatives of the band Spirit, which played some dates with the British rock legends. 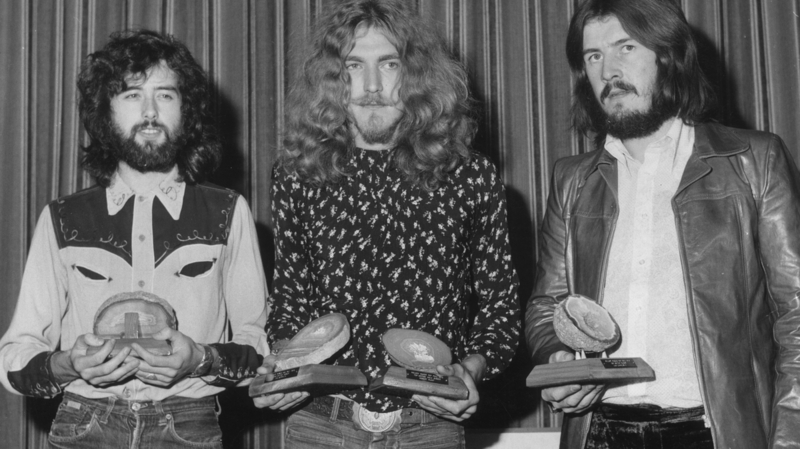 Jimmy Page, Robert Plant, and John Bonham of Led Zeppelin, in 1970. A new lawsuit says the group borrowed from another band's work without crediting it, for the huge hit "Stairway to Heaven." Did a band from Los Angeles get ripped off by Led Zeppelin? That's the claim in a new lawsuit by representatives of the band Spirit, which played some dates with the British rock legends in their early days in America. The story is a familiar one: A band plays a bit of music that sounds a lot like another song; a debate ensues. But in this case, the band is Led Zeppelin, and the song is "Stairway to Heaven," a megahit so popular it's been ubiquitous in bars and on the radio for decades. The similarity of the meditative guitar-picking in both 1971's "Stairway to Heaven" and 1968's "Taurus," an instrumental track on Spirit's self-titled album, has been discussed by music fans for years. Now a lawsuit over the songs' similarities has sent the debate toward a court date. You can listen to the Spirit song and see for yourself what you think. As Bloomberg Businessweek reports, the lawsuit was filed on behalf of the trust of Spirit guitarist Randy California, who died in 1997. The band's original bassist is also involved in the case. "The idea behind this is to make sure that Randy California is given a writing credit on 'Stairway to Heaven,' " says attorney Francis Alexander Malofiy. "It's been a long time coming." "Stairway's stature—financially, culturally, and musically—is towering. By 2008, when Conde Nast Portfolio magazine published an estimate that included royalties and record sales, the song had earned at least $562 million." That number is out of date — and it's poised to rise higher, as Led Zeppelin is set to release new versions of its albums this summer. News of the lawsuit has prompted a lively comment session over at Rolling Stone, where readers are debating the ability to copyright chord progressions and chords. "Well, if you listen to the two songs, you can make your own judgment. It's an exact... I'd say it was a rip-off. And the guys made millions of bucks on it and never said, 'Thank you,' never said, 'Can we pay you some money for it?' It's kind of a sore point with me. Maybe some day their conscience will make them do something about it. I don't know." As that story noted, Led Zeppelin had likely heard the song on its first American tour, when it opened up for Spirit. Writing about the 40th anniversary of "Stairway To Heaven" in 2011, NPR's Ann Powers noted that elements of it "may or may not" have been borrowed from the Spirit song. But she also noted, "nobody but Zep could have molded those chord progressions into such a masterpiece of excess." "But it is that holiest of Holy Grails, 'Stairway To Heaven,' that will shock the faithful. On one of Led Zeppelin's early tours, they had opened for the California art-rock group, Spirit. In the liner notes to the reissue of Spirit's 1968 eponymous debut, the band's guitarist Randy California mentions the fact that Jimmy Page took special interest in an original entitled 'Taurus.' There is no doubt that Page appropriated the opening guitar lines note for note on 'Stairway To Heaven.' Further, the chord progression in 'Stairway To Heaven' is incredibly similar to a song by the Chocolate Watch Band, 'And She's Lonely.' The Yardbirds played with the Chocolate Watch Band during Page's tenure. It would be quite ironic if he did indeed lift the chords from the Chocolate Watch Band. The Chocolate Watch Band, to those in the know, were the ultimate Yardbirds clone. Wouldn't it be fitting that a former Yardbirds guitarist ripped off something from a band that based an entire career around sounding like that famed quintet?"